BALTIMORE, MD, January 9, 2014 (Operation Rescue) - During an inspection conducted by the Maryland Department of Health on February 20, 2013, officials discovered that patient Maria Santiago, 38, died during a 13-week abortion at the Associates in OB/GYN Care, located on Baltimore’s Cheverly Road – which is situated inside a residential condominium complex. Three Maryland abortionists who worked at the seedy Baltimore clinic owned by the notorious late-term abortionist Steven Chase Brigham have received further discipline, but disturbingly, the one directly responsible for the abortion-related fatality has received the lightest sanctions. The abortionists Iris Dominy, Michael Basco, and Mansour Panah, were each involved in Brigham’s Baltimore Associates in OB/GYN Care abortion operation, which, along with three other affiliates, were closed last year by the state due to repeated violations that endangered the safety of women. Abortionist Iris Dominy told a state inspector that the sedated Santiago had slept throughout her abortion. According to the deficiency report issued after the inspection, Dominy completed the abortion on the sleeping woman, then left the room. An unqualified worker was left alone with the patient. That worker occupied herself with filling out paperwork while the patient remained on the abortion table. Sometime later, the worker called for a second employee to help her dress the unconscious Santiago and move her to the recovery area. The second worker noticed that Santiago was pale and not breathing. Dominy was notified and returned to the procedure room where she sat the unconscious Santiago up and began a “sternum rub” instead of standard Cardio-Pulmonary Resuscitation. No one at the clinic, including Dominy, had current CPR certification. A crash cart in the hallway was not used, and the defibrillator was broken. Police report taken at the time of Santiago’s death. Click to view full document. Operation Rescue recently obtained documents showing that on October 15, 2013, the Maryland Board of Physicians (MDBP) issued only a reprimand to Dominy for negligence that resulted in Santiago’s death. Dominy was placed on probation until only 16 hours of continuing education classes in sedation and monitoring can be taken and verified. Dominy is also prohibited from administering sedation until the board issues its specific approval, but is otherwise able to continue practicing medicine. Meanwhile, Dominy’s two associates fared somewhat worse with the MDBP. Mansour Panah served as the Medical Director for Brigham’s now-shuttered Maryland abortion clinics and oversaw patient care. Initially, Panah’s medical license was suspended upon discovery of the dangerous conditions at Associates in OB/GYN Care, but his license was later reinstated. It was only when Panah failed to appear at his disciplinary hearing held on October 25, 2013, that the MDBP determined that the “public health, safety, or welfare imperatively required” that Panah’s license be summarily suspended — for the third time in his career — according to records recently obtained by Operation Rescue. 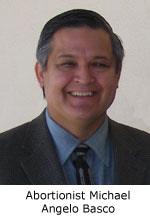 Documents acquired recently by Operation Rescue show that third abortionist, Michael Basco, who also worked for Brigham’s Associates in OB/GYN Care in Maryland, has had his medical licenses suspended in California, Virginia, and Washington, D.C. pending the outcome of charges filed against him by the MDBP in July 2013. Operation Rescue had discovered that Basco was continuing to do abortions in Washington, D.C. after his Maryland license suspension and immediately notified D.C.’s medical board of Basco’s Maryland charges. Basco’s license in Maryland remains under suspension pending a final disposition of his case. Basco is accused of operating in conditions that violated health and safety standards and for allowing an unlicensed, unqualified worker to administer abortion drugs outside Basco’s presence to a woman he had never seen. After the abortion drugs were administered, Basco discovered the woman was 22 weeks pregnant with twins. Even though her abortion had already started, he refused to continue the procedure and essentially turned her adrift without any plan of action. The woman later submitted to a surgical abortion at another clinic unrelated to Brigham’s abortion business. “Anything less that total revocation of his medical license is unacceptable and would leave women’s lives at risk,” Newman said. With the license suspensions of Panah and Basco, the abortionist directly responsible for the death of Maria Santiago, Iris Dominy, remains the only one of Brigham’s former Maryland abortionists that can still practice medicine. Remember that late-term abortionist LeRoy Carhart received no discipline whatsoever from the MDBP after his abandonment of Jennifer Morbelli delayed her access to emergency medical care, and one could conclude that killing abortion patients is not a serious matter in Maryland. This does not sit well with Operation Rescue’s Newman. Dominy, Panah and Basco’s employer, Steven Chase Brigham, has completely escaped accountability for his fatal abortion business in Maryland. Since Brigham has never been licensed in Maryland, he is outside the MDBP’s authority to impose discipline. In 2010, Brigham was caught operating an illegal, secret late-term abortion clinic in Elkton, Maryland, after a patient nearly died from a perforated uterus and pulled bowel during a late-term abortion that had been illegal started in New Jersey and continued in Maryland. The MDBP issued Brigham a letter ordering him to cease and desist the unlicensed practice of medicine in Maryland. He was later charged with murder after police raided his Elkton clinic and discovered the bodies of 35 late-term aborted babies stored in a blood-soaked freezer. Regrettably, those charges were soon dropped after an expert witness withdrew from the case. The MDBP did revoke the license of Brigham’s Elkton associate, Nicola Riley, but that decision was not enough to convince her home state of Utah to take similar action. Riley continues to practice in Utah today. Brigham once held licenses in California, Florida, Georgia, Pennsylvania, New York, and New Jersey. His New York license was revoked in 1994 after a series of horrifically botched abortions, and he either surrendered the remaining licenses (except in his home state of New Jersey) under threat of revocation or allowed them to expire. In New Jersey, Brigham’s sole remaining medical license remains under suspension. He faces multiple charges related to illegal abortions and deception, having submitted phony malpractice insurance documents to the state when in fact he was operating illegally without insurance. 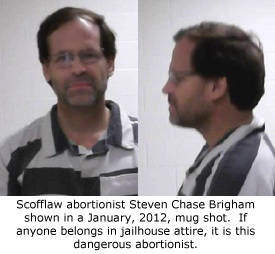 But it is doubtful that even license revocation would end Brigham’s abortion career or close his clinics. While some states are starting to see through Brigham’s scams, he continues to operate a chain of 9 abortion clinics in New Jersey and Virginia. All abortion clinics even remotely related to him were shut down by authorities in Maryland and Pennsylvania. Nearly all the abortionists Brigham has had working for him have their own sordid histories of discipline, as detailed previously by Operation Rescue in an article published in November 2010. However, often the reach of regulatory agencies falls short. In those cases, new laws with stiff criminal penalties may be the only solution to protecting the public. Abortionists that have had medical licenses revoked should not be allowed to hold interests in abortion businesses. Abortionists who operate illegally or deceptively should be jailed. Those who injure or kill patients should not be given second, third, and fourth chances. Licenses should be revoked and criminal penalties imposed in order to ensure that more women do not die. Enforcement duties should be turned over to the offices of local criminal prosecutors more often.